The Police Reform and Social Responsibility Act 2011 introduced significant changes in police governance and accountability. Police Authorities were replaced by directly elected Police and Crime Commissioners. On 5 May 2016, voters re-elected Mr David Lloyd to serve as Hertfordshire’s Police and Crime Commissioner. The Commissioner has been given responsibility for the way policing is delivered in the county and will hold the Chief Constable to account for running the force. The Commissioner will decide how funding related to policing and crime reduction is allocated and, in consultation with the Chief Constable, set the strategic direction and objectives of the force through his Police and Crime Plan. For further information about the Hertfordshire Police and Crime Commissioner, please visit the Commissioner's website. 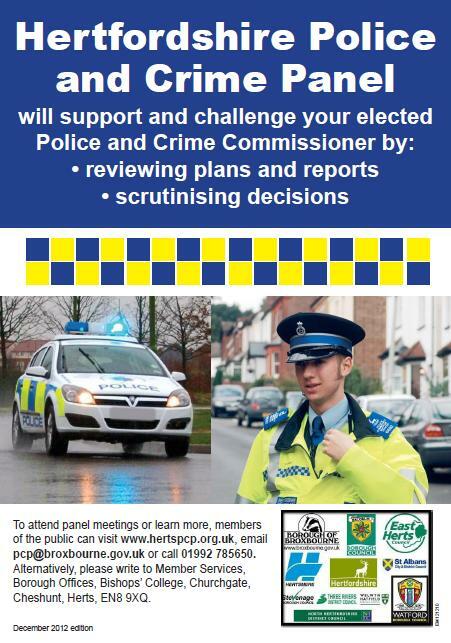 The Hertfordshire Police and Crime Panel has been established to scrutinise and support the work of the Commissioner. The Commissioner is required to consult with the Panel on his plans for policing, as well as the precept (the money collected from council tax for policing) and certain key appointments. Broxbourne Borough Council is the host local authority for the Panel and provides administrative and other support to the Panel and its members. All agendas, papers and minutes from previous Panel meetings are available.